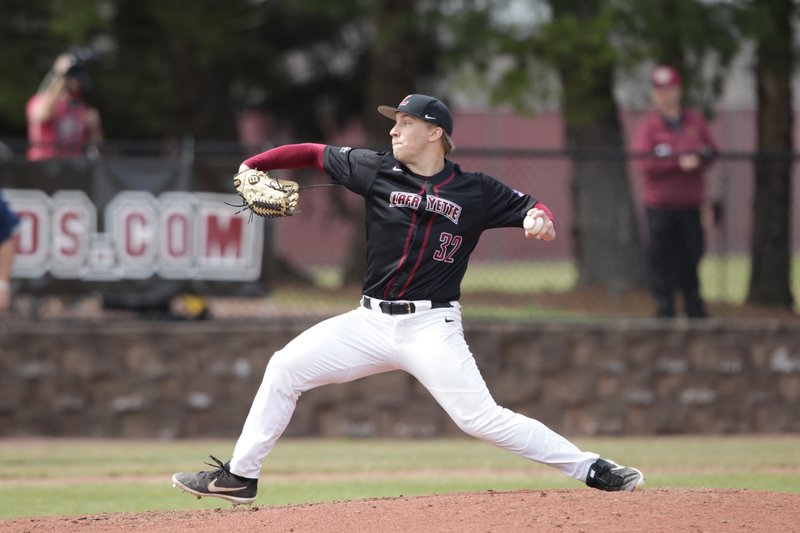 The men’s baseball team picked up three impressive wins this past weekend to sweep Patriot League rival Bucknell. Each game was won in demanding fashion as the series included two blowout wins and a walk-off win for the Leopards. The Leopards now have series wins over both Lehigh University and Bucknell University. On Wednesday the winning streak was snapped against Rutgers University. The Leopards began their series against Bucknell with an 11-3 win in the first game on Saturday. Junior pitcher JP Woodward was on the mound for the Leopards and he pitched a complete game en route to the Leopards win. Woodward dominated in the game, allowing only one run to go along with eight strikeouts in seven innings pithed. The Leopards got on the board early in the first game, scoring four of their 11 runs in the first inning, with the help of three Bucknell errors. Junior outfielders Trey Durrah and Jake Sniegocki carried the load on offense, totaling four hits, seven RBIs, and three runs between the two of them. Bucknell scored all three of their runs in the third inning, temporarily making it a one run game, but Lafayette tacked on five in the bottom of the third to run away with it. In their second game, the Leopards won in much more thrilling fashion, walking off against Bucknell to win 6-5. Sophomore pitcher Michael Dunn came out of the bullpen for the Leopards and threw four scoreless innings with a strikeout to earn his second win of the year. Senior outfielder Dan Leckie, whose eight game hitting streak ended in the first game, homered for Lafayette in the win. The Leopards were down for most of the contest, before forcing extra innings in the ninth. Sophomore outfielder Colin Hartley drove in the winning run in the ninth inning on a sacrifice fly. Senior first baseman Richard Villa and sophomore infielder Ethan Stern also homered in the Leopard’s win, giving Lafayette three homers on the day. In their final game against Bucknell, the Leopards took care of business early, putting up six runs in the first inning and not looking back after that. Junior pitcher Brett Kreyer was on the mound for the Leopards and pitched a complete game for Lafayette. Kreyer allowed one earned run and struck out three en route to his second win this season. Bucknell scored four runs in the third and one in the fifth to make the game exciting, but Lafayette scored four in the seventh to win in commanding fashion once again. Freshman catcher Zach Savage finished the game going two-for-two with two RBIs and a run. Durrah also tacked on two hits and two RBIs in the win. The Leopards fell to Rutgers 9-3, dropping their overall record to 11-19, while they still hold a more impressive 6-4 record in conference matchups. The Leopards will travel to West Point for more Patriot League play tomorrow for a three-game series against Army.